The Wacom DTU-1031X is the economical solution for corporate or institutional customers who require a display with a minimal footprint that allows users to view or fill out full-size documents and sign them electronically. With its 10.1" LCD, customers can clearly see the contents of a document and sign with confidence. 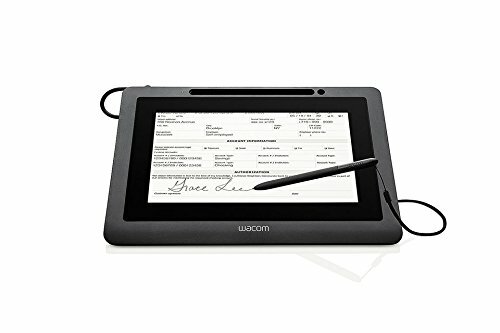 The Wacom DTU-1031X combines a 10.1" LCD panel with Wacom's patented pen technology for an excellent solution for viewing and signing full-size documents. State-of-the-art encryption is included to ensure secure transactions. This unit connects to PCs with just one USB cable to reduce clutter. Its surface is completely flat, and can be mounted into kiosk or POS systems. The DTU-1031X's slim design is perfect for using flat on counters, and also includes an integrated stand to use at an angle. VESA mounting holes are provided to allow for use with third party arms and stands.